One thing that we emphasize when talking about our database is what it really represents. 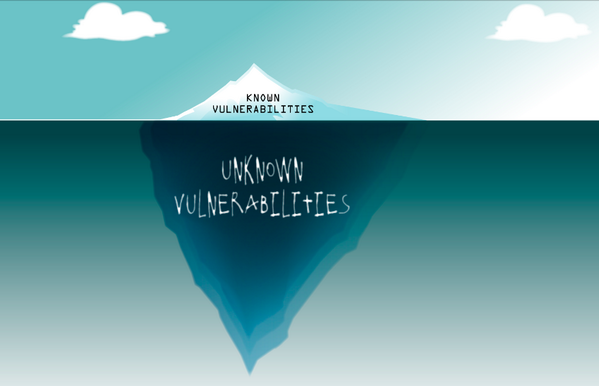 While we catalog tens of thousands of vulnerabilities more than any other database, we are also upfront that there are still thousands, possibly tens of thousands more vulnerabilities that are already public, but just haven’t found their way into a VDB yet. These are not 0days, vulnerabilities that exist, have been discovered, but remain private. These are public and out there to be cataloged. We have been actively scouring a variety of resources to catalog those vulnerabilities over the last ten years, and we have a long ways to go. Earlier today I saw an image that really visualizes this point on Twitter via @nitr0usmx. He indicates that the image originates from Fuzz Testing for Dummies by Art Manion and Michael Orlando. As you read about vulnerabilities and patch your systems, remember the bigger picture. We’re offering a bounty… of sorts! In our pursuit of a more complete historical record of vulnerabilities, we’re offering a bounty! We don’t want your 0-day really. OK sure we do, but we know you are stingy with that, so we’ll settle on your ~ 12,775 day exploits! First, the bounty. This is coming out my pocket since it is legacy and doesn’t immediately benefit people using us as a vulnerability feed. As such, this isn’t going to be a profit center for you. In addition to the personal satisfaction of helping preserve history, shout outs on this blog and multiple Twitter feeds, I will send you something. Want a gift card for Amazon? Something else I have that you want? I’ll make my best effort to make it reasonably worth your while. I know it isn’t a cool $1,337 Google style unfortunately, but I will try! Now, what am I after. Not “a” vulnerability, but any of several lists of vulnerabilities from decades ago. These were maintained in the 1980’s most likely, one of which was internal at the time. I am hoping that given the time that has passed, and that the vulnerabilities have long since been patched and most products EOL’d, they can be disclosed. If you don’t have a copy but know someone might, send me a virtual introduction please! Any lead that results in me getting my hands on a list will be rewarded in some fashion as well. If you have a copy but it is buried in a box in the garage, let me know. I will see about traveling to help you dig through junk to find it. Seriously, that is how bad I want these historic lists! Any public-referenced vulnerability before 1980 that we do not have in the database. I know there has to be more out there, help us find them! Any SCADA or ICS vulnerability before 1985-06-01! That’s it! Pretty simple, but may require some digging mentally or physically. In previous blog posts and on Twitter, I have shown and mentioned various methods for searching OSVDB to find interesting data. However, there is no written guide to the ins-and-outs of the data. The search interface is simple enough, but it can be used in a manner that allows for some complicated and useful searches that are not immediately obvious. This blog post will show several examples and highlight some of the interesting data we have available, along with an explanation to the method of our madness. The OSVDB classification system allows for a variety of one-click searches. Using the search interface and selecting any of the classifications (single, or multiple) will let you quickly search for denial of service, exploit public, security software, and a lot more. Note that our data set is not complete, and not all of our entries have classification data. Do not rely on this type of search for complete results. Over time as the data set is completed, it will provide powerful one-click searches that will make for interesting metrics. SCADA, the hot topic lately. Using the “vulnerability text” field, input “SCADA” and select “All Text” (defaults to “Titles only”). This will bring back all vulnerabilities related to SCADA products. Another field that has been interesting to us for several years, that will likely gain more attention this year in the wake of recent election problems, is Electronic Voting Machines. We’ve all read articles about the insecurity of Diebold for example. But have you looked at just how bad it is, and how bad the other vendors are? Do a “vulnerability text”, “all text” search for “electronic voting machine”. Prepare to be scared for the coming elections. There has been an increasing interest in vulnerabilities in embedded computers found in cars. While “car hacking” has been going on for many years, a big part of that field is based on modding and enhancing a car, not so much exploiting vulnerabilities in it. OSVDB has only delved into this topic a little bit so far, but it has been on our radar for some time. Doing the same “all text” search for the word “automobile” will bring up what we have. There are dozens of research papers and sites on our list to check out as time permits. We have spent a lot of time digging into the history of encryption algorithms, noting when they were effectively compromised or proven vulnerable to varying degrees of practical attacks. Having these in the database makes for an interesting history, great reference, and potentially helpful to pen-testers that find applications using insecure algorithms. Even if you don’t have time to leverage the weakness during the test, you can provide a standardized reference in the report. To find these, do a “vulnerability text”, “title only” search for the word “algorithm”. Using specific keywords in our standardized titles, quick searches can be performed for other interesting sets of vulnerabilities. For example, the word “hardcoded” is used to denote when a vendor uses an account name, password, community string, or other piece of identifying / security information in a manner that does not allow the user to change it. It is scary to see that hardcoded accounts and credentials are still being used in 2012, by security vendors no less. In a similar vein, the word “persistent” is used to denote other conditions where some form of weakness will continue to be present, regardless of administrative action. Want to find vulnerabilities in Drupal, but not all those third-party modules? Title search “drupal -module -theme” to see the ‘core’ software issues. Similarly, title search for “wordpress” and “wordpress -plugin” to get a feel for the disparity in vulnerabilities between the core software and third-party plugins. These represent just a few examples of the types of searches you can perform using OSVDB to ferret out interesting data and vulnerabilities that tend not to make it in the other VDBs. Layered Technologies has provided hosting for the OSVDB production and development servers since October 2007 and continues to support the project. The new servers have been a critical contributing factor to the success and deployment of OSVDB 2.0. In fact, OSVDB 2.0 and the new services that we are now offering have been more resource intensive than we originally thought and we must upgrade. On Friday, May 16th at 9pm EST we will be taking the OSVDB server offline. The outage should be minimal and service will be restored as soon as possible. We would like to take a moment to thank Jeremy Suo-Anttila for his assistance and support of the OSVDB project. If you are interested in high quality but affordable hosting with very responsive support we recommend that you contact Layered Technologies. I had the need to search for Apache vulnerabilities today for the pesky day job. One word, one search and four hours later I realized just how bad our Apache entries were. Enter headache #1. Unfortunately, the rest of the VDBs were no better. What did I want a concise list of? Seems straight forward, and the second search is relatively easy to get at any VDB as “Apache Tomcat” is a consistently used name for the product and distinct enough not to catch other products. So why isn’t the first? Many moons ago, Apache was just “Apache” and everyone knew it was the web server. Eventually Apache branched out and currently maintain an incredible amount of projects. The old “Apache” we all know is really “Apache HTTP Server” which VDBs don’t consistently use, especially the older ones. This is understandable because when CVE added an Apache vulnerability in 1999, that was all there was. These days, just using “Apache” to describe any of their projects is overly vague and irresponsible. Thus, four hours later i’d like to think that OSVDB’s entries are a lot better off for many reasons, that being the first and most simple. Modules like modinclude and modimap are ‘base’ modules and are part of the Apache web server for most installations. Vulnerabilities in these modules will impact most Apache users. Modules like mod_rewrite are extension modules and must be specifically selected during the configure/make process. Modules like modperl are .. what? Hello Headache #3. If you check the modperl homepage, you don’t see the easy to spot designation if it is ‘base’ vs ‘extension’, even though it is part of the Apache project. This is more understandable with modssl since it’s an extension and maintained on a non-Apache web page. Apache module authors: please make this clear! Before you fire up your e-mail client to send me obnoxious mails, consider that these are “some” of the supported modules Apache offers, and there are 443 more modules that aren’t supported but definitely useful to many folks. What about moddigest_apple and others? Not fun for those who are tasked with tracking vulnerabilities. As a result of all this, OSVDB is now using consistent titles to help distinguish all of the above. Here are a few guidelines to help better understand it, and we hope that other VDBs will follow suit to assist their users. “Apache HTTP Server” is used for the Apache web server (httpd). If the module is ‘external’, meaning it is not part of the Apache distribution, we use “mod_whatever for Apache HTTP Server”. This will help our users more easily distinguish if the vulnerability affects them, assist in searches with more concise results and generally make me feel better about the VDB world.